Indianapolis-based Music For All (MFA) announced today during a lunchtime press conference that it would relocate its annual Summer Symposium, a weeklong summer camp for high school music students, from the campus of Illinois State University (ISU) in Normal, to Ball State University in Muncie, Ind., starting in June of 2011. Beginning in 1976, MFA's Summer Symposium was originally headquartered at the University of Whitewater Wisconsin before moving to Illinois State University. Drum Corps International has hosted its annual DCI Central Illinois Premier Event at ISU as the finale to the Symposium since 1999. A favorite of corps members and fans alike, the DCI event has long been known for its enthusiastic crowds thanks to the excitement of hundreds of high schoolers filling the stands. As a strategic partner of Music For All, during each of the past several years, Drum Corps International has given marching band tract students at the Symposium the opportunity to work directly with a DCI corps (Carolina Crown in 2010), ultimately performing a segment of the corps' show alongside corps members to conclude the event. "We're excited that Music For All has decided to move its Symposium to Ball State in our shared home state of Indiana," said Drum Corps International Director of Events Susan Kuehnhold. "This will give us the exciting opportunity to host a brand new early-season event in Central Indiana continuing our close relationship with MFA and the Summer Symposium in 2011. 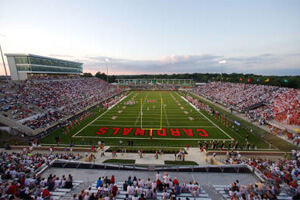 With the Symposium scheduled from June 18-25, 2011 in Muncie, the DCI Premier Event would fall on Friday, June 24 taking place at Ball State's 22,500 seat Scheumann Stadium. Kuehnhold says that DCI is already in contact with Illinois State University to continue to run its annual Central Illinois event at the university's Hancock Stadium on a similar date as in past years. Additional information about 2011 Drum Corps International Tour events will be released in the coming months. Read more about Music For All's relocation of the Summer Symposium to Ball State.